“GMRT is a world-class instrument, recently upgraded with new receivers, and was able to detect the very faint signal” coming from the ultimately doomed Schiaparelli EDM lander on Mars. In December 2003, a British mission to Mars called Mars Express was nearing the red planet for the final part of its journey. It consisted of two parts: the Mars Express Orbiter, which would get into orbit and study the planet’s surface and subsurface composition and atmosphere; and the Beagle 2 lander, a set of instruments that would drop to the surface, remain stationary and make measurements of their own. The deployment was supposed to happen on December 19 – and it did. By December 25, the Mars Express Orbiter was in an elliptical orbit around the planet and began its observations. However, even by February 2004, mission scientists didn’t know what had happened to Beagle 2. In fact, they wouldn’t know until 12 years later, when NASA’s Mars Reconnaissance Orbiter spotted the lander sitting intact on Mars’s surface. Scientists hadn’t been able to contact Beagle 2 because two of its solar panels hadn’t fully unfurled, blocking the antenna. Since the 1960s, scientists have had bad luck with Mars landers, especially in the late 1990s. However, in all this time, they haven’t equipped landers with radio antennae that transmit data as the craft descends to the surface, instead choosing to rely on the communications antenna that comes online only after the lander has landed healthily. Before the Beagle 2 failure in 2003, there was NASA’s Mars Polar Lander failure in 1999, whose fate hasn’t been confirmed still. And after Beagle 2, there was the Schiaparelli lander of the Euro-Russian ExoMars mission on October 19 this year. Though the ExoMars Trace Gas Orbiter got into Mars orbit comfortably, the lander appears to have crashed on the martian surface. This time, however, there was confirmation – as well as live transmission as the lander descended, thanks to the world’s largest telescope of its kind located in Maharashtra, India. The National Centre for Radio Astrophysics (NCRA) to the city’s north is home to the aptly named Giant Metre-wave Radio Telescope (GMRT). Built at $20 million and going operational in 1995, the GMRT is actually an array of 30 telescopes each observing radiation coming in from space with a wavelength in the order of metres – or radio-frequency. The telescopes rely on a technique called aperture synthesis to make their studies. The larger a telescope’s antenna is, the higher the resolution with which it can observe its targets. Aperture synthesis allows multiple telescopes to act as a single giant antenna, where the size of the antenna is the distance between the most separated telescopes in the network. In the case of GMRT, this is 25 km. There is no telescope bigger than the GMRT when it comes to observing in the metre wavelength, which corresponds to radio waves. It is often used to study distant galaxies, blackholes, quasars and other high-energy cosmic objects billions of lightyears away. And because of its sensitivity, the GMRT can also be used to detect faint radio signals coming from objects closer to Earth – for example, a lander descending on Mars. 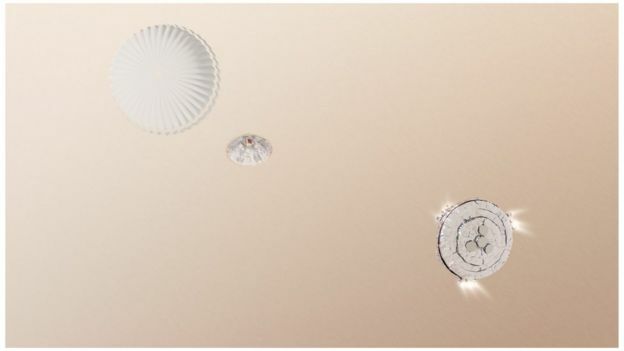 In the case of the Schiaparelli lander of the ExoMars mission, scientists found that a software glitch could have forced the lander’s parachute to separate sooner than necessary, causing the lander to crash at 300 km/hr. This information wouldn’t have been available now if not for the GMRT. In fact, scientists have also noted a difference between data received at the GMRT and that collected by probes orbiting Mars when Schiaparelli stopped working, and are currently following this up. The Schiaparelli lander had been equipped with an ultra-high frequency (UHF) radio onboard to allow it to communicate with orbiters currently around Mars; the orbiters would’ve then relayed the signal to receiving stations on Earth. But with the ExoMars mission, scientists wanted to experiment with the GMRT – even though Schiaparelli’s UHF radio wasn’t powerful enough to transmit all the way to Earth, a distance of 54 million km, the telescope seemed sensitive enough to be able to pick that up. According to Thomas Ormston, a spacecraft operations engineer at the European Space Operations Centre in Darmstadt, Germany, “In practice testing during Schiaparelli separation from the [ExoMars orbiter], we did see the weak trace of the signal from the lander at GMRT” with only 18 telescopes in the array available at the time. Ormston also wrote that there had been some concerns during the descent phase that GMRT might not receive the signal if Schiaparelli’s radio was facing away. According to people familiar with the upgrades, NASA’s Jet Propulsion Laboratory in Pasadena, California, helped equip GMRT with the special receivers. That the GMRT experiment was a success is also good news for Russia as well as India. Between 1960 and 1988, the USSR participated in 17 missions to Mars; and between 1996 and 2016, in three (including Schiaparelli). And in these 20 missions, the Russians have found success only in two missions – the last time in 1973. Even then, the Mars 5 mission lasted just nine days against its planned lifetime of at least one year. In fact, the USSR/Russia’s last successful interplanetary expedition was the Vega program to Venus, followed by a flyby of Halley’s comet, that concluded in 1985. Though ESA has declared the Schiaparelli part of the mission a success (because it did demonstrate that its way of landing almost worked), its landing gear was built by Russian engineers, the same people who will be responsible for landing the rover in 2021. With GMRT data – as McDowell said – they will know now what bits worked and what didn’t. As for India: the Indian Space Research Organisation (ISRO) plans to launch a rover as well as a lander on Mars between 2020 and 2022, in a mission it has called Mangalyaan 2. As with the previous mission, which succeeded in September 2014 when the Mars Orbiter got into orbit around Mars, the rover and lander may also be successful on ISRO’s first try. And the GMRT could play an important role in ensuring that. Researchers sift through clues after Schiaparelli crash in hopes of averting mistakes in 2020 mission. A model of the ExoMars lander Schiaparelli, in front of European Space Agency scientists explaining its failed landing on Mars. Unlike the British-led and ESA-operated Beagle 2 mission, which disappeared during its landing on Mars on Christmas Day 2003, Schiaparelli sent data to its mother ship during its descent. Preliminary analysis suggests that the lander began the manoeuvre flawlessly, braking against the planet’s atmosphere and deploying its parachute. But at 4 minutes and 41 seconds into an almost 6-minute fall, something went wrong. 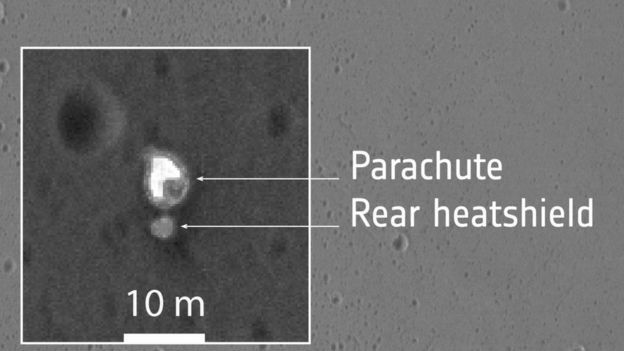 The lander’s heat shield and parachute ejected ahead of time, says Vago. Then thrusters, designed to decelerate the craft for 30 seconds until it was metres off the ground, engaged for only around 3 seconds before they were commanded to switch off, because the lander's computer thought it was on the ground. The lander even switched on its suite of instruments, ready to record Mars’s weather and electrical field, although they did not collect data. “My guess is that at that point we were still too high. And the most likely scenario is that, from then, we just dropped to the surface,” says Vago. The craft probably fell from a height of between 2 and 4 kilometres before slamming into the ground at more than 300 kilometres per hour, according to estimates based on images of the probe’s likely crash site, taken by NASA’s Mars Reconnaissance Orbiter on 20 October. The most likely culprit is a flaw in the craft’s software or a problem in merging the data coming from different sensors, which may have led the craft to believe it was lower in altitude than it really was, says Andrea Accomazzo, ESA’s head of solar and planetary missions. Accomazzo says that this is a hunch; he is reluctant to diagnose the fault before a full post-mortem has been carried out. But if he is right, that is both bad and good news. European-designed computing, software and sensors are among the elements of the lander that are to be reused on the ExoMars 2020 landing system, which, unlike Schiaparelli, will involve a mixture of European and Russian technology. But software glitches should be easier to fix than a fundamental problem with the landing hardware, which ESA scientists say seems to have passed its test with flying colours. “If we have a serious technological issue, then it’s different, then we have to re-evaluate carefully. But I don’t expect it to be the case,” says Accomazzo. The ExoMars team will try to replicate the mistake using a virtual landing system designed to simulate the lander’s hardware and software, says Vago, to make sure that scientists understand and can deal with the issue before redesigning any aspects of ExoMars 2020. The rover mission has already been delayed by two years, owing to hold-ups on both Russian and European sides, but Vago believes that making tweaks to its design will not push the mission back. “At this point, no one wants to think about flipping to 2022. It was painful enough to go from 2018 to 2020,” he says. The 2020 mission still has a budget shortfall of around €300 million (US$326 million), which ESA will request from European Union member states at a meeting of ministers in December. Asked at a press briefing on 20 October whether Schiaparelli’s failure would jeopardize the mission, ESA director general Johann-Dietrich Wörner said it wouldn’t have any impact. “We have the function which we need for the 2020 mission, so we don’t have to convince them, we just have to show them,” he told reporters. ESA is keen to stress that overall, the ExoMars mission can be seen as a triumph: Schiaparelli sent back test data from the majority of its descent, and its sister craft — the Trace Gas Orbiter — successfully manoeuvred into Martian orbit. The orbiter is the more scientifically valuable of the two halves of the mission: from December 2017, it will study Mars’s atmosphere, aiming to find evidence for possible biological or geological sources of methane gas. It will also be a communications relay for the 2020 rover. A half-scale model of ESA's 2020 Mars rover. It will descend using parachutes and thrusters. 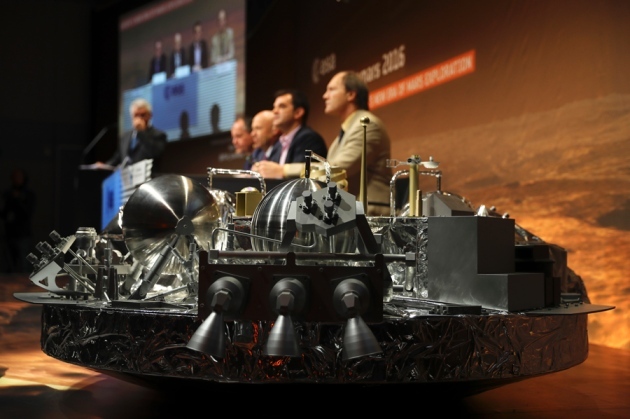 At the ministerial meeting, ESA officials will emphasize the success of the Trace Gas Orbiter (TGO), the other part of the ExoMars 2016 mission. As Schiaparelli fell to its doom, the TGO entered a highly elongated 4.2-day orbit around Mars. Next month, it will begin to calibrate science instruments designed to sniff out methane and other trace gases in the atmosphere to pinpoint their origin—not just where they arise, but whether they emanate from geological or biological sources. In March 2017, TGO will begin dipping down into the martian atmosphere, generating friction that will slow and circularize its orbit so that it can begin science observations later in the year. “We have 100 kilograms of science instruments in orbit around Mars. Solving the mystery of methane is now in our future,” David Parker, ESA’s director of human spaceflight and robotic exploration, told reporters last week. Compared with the expected science return of the TGO, the weather data that Schiaparelli would have collected with just a few days of battery power on the surface was an afterthought. But as students of ESA’s comet-orbiting Rosetta mission learned, the fate of plucky landers resounds in the public consciousness. In November 2014, Rosetta dropped the Philae lander to the surface of a comet, where it survived a couple days. Even though its few pictures and measurements were far surpassed by those of its mother ship, it captured the public’s fancy and was a public relations coup. ESA engineers studying what happened to Schiaparelli are working with information from several sources: data the lander transmitted to the TGO during its descent and elements of the same signal that were picked up by ESA’s Mars Express orbiter and a radio telescope on Earth. All sources agree that the signal abruptly stopped around 50 seconds before the expected landing. Early analysis suggested that something went awry after the lander shed its parachute and heat shield and fired its thrusters to slow the final descent. That transition seemed to begin too soon, and the thrusters only fired for a few seconds before cutting out. On 20 October, the day after the landing, NASA’s Mars Reconnaissance Orbiter (MRO) flew over the landing site and snapped images with its low-resolution camera. These showed a white dot, thought to be Schiaparelli’s parachute, and 1 kilometer away a fuzzy dark patch, 15 by 40 meters in size. ESA says this dark smudge is probably soil disturbed by the impact of Schiaparelli or even the scar of an explosion, since the lander’s propellant tanks would have been full on impact. ESA says the lander probably fell from a height of up to 4 kilometers (the parachute was meant to release it at 1.1 kilometers), and that it would have hit the ground at 300 kilometers per hour. MRO is expected to take more pictures of the site this week with its high-resolution camera. The pressure is on Schiaparelli’s engineers because the ExoMars 2020 rover and its landing platform are already taking shape. Many components, which are being duplicated from Schiaparelli with little change, need to be shipped to Russia for integration into the spacecraft by next year, says Thierry Blancquaert, Schiaparelli’s mission manager. The aeroshell that will protect the 2020 rover during descent and slow it as it enters the atmosphere is the same shape but instead will be built by Russia, which has been partnering with ESA on the ExoMars program since NASA pulled out in 2012. The parachute in 2020 will be the same type but will deploy in two phases—a small one followed by a big one—and the main chute will be much larger: 35 meters across compared to Schiaparelli’s 12 meters. The thrusters that will ease the 2020 rover onto the surface will be different, and are currently being developed by Russian space agency Roscosmos. But the radar Doppler altimeter—which senses the surface and allows the thrusters to bring the spacecraft down gently—as well as the guidance and navigation systems will be the same as Schiaparelli’s, so those parts of last week’s descent will be under special scrutiny. This Oct. 25, 2016, image from the HiRISE camera on NASA's Mars Reconnaissance Orbiter shows the area where the Europe's Schiaparelli test lander struck Mars, with magnified insets of three sites where spacecraft components hit the ground. It adds detail not seen in earlier imaging of the site. An Oct. 25 observation using the High Resolution Imaging Science Experiment (HiRISE) camera on NASA's Mars Reconnaissance Orbiter shows three impact locations within about 0.9 mile (1.5 kilometers) of each other. 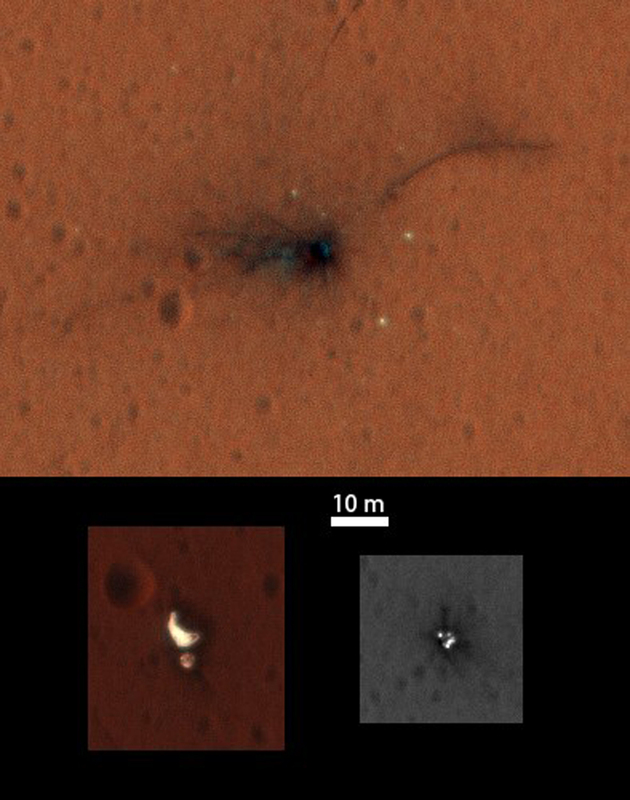 The Schiaparelli lander is seen in greater detail than ever before, lying on the Martian surface. It is well within its intended landing zone but obviously unable to function. The images, gathered by Nasa, could provide important new clues about what went wrong. They show a dark patch around the capsule - a possible hint that a fuel tank exploded - and the indication is that the impact gouged out a crater 50cm deep. Last week's landing - a joint Esa-Russian Space Agency (Roscosmos) endeavour - was billed as a "technology demonstrator" to pave the way for a far bigger venture in 2020 with a sophisticated rover to hunt for clues about life. The loss raises difficult questions about the risks involved in that follow-on mission and whether Esa's member governments will be too nervous to pledge the funds needed to mount it. The Schiaparelli spacecraft was meant to touch down last week using a combination of a heat-shield and a parachute to slow its fall and retro-rockets to lower it to the surface. Instead communications were lost during what should have been the final minute of the descent and it is estimated that the spacecraft hit the ground at about 300kph. It was quickly established that the parachute and back cover were released earlier than they should have been, according to a pre-programmed sequence of tasks. It is also known that the retro-rockets, which should have fired for 30 seconds, only operated for three or four seconds, and the lander probably fell from a height of 2-4km. In the aftermath of the attempt, Esa's Director-General, Jan Woerner, claimed that the mission was a success because the spacecraft transmitted data for five of the six minutes of its descent, providing useful information and proving that key stages of the operation had worked well. He also highlighted that the lander's mother ship, known as the Trace Gas Orbiter, had been successfully placed in an orbit that would allow it to sniff the Martian atmosphere for hints of methane. Soon after the mission, Nasa's Mars Reconnaissance Orbiter gathered pictures of the landing zone which revealed the presence of two new dots in the Martian landscape - a dark one for the spacecraft and a white one for the parachute. Now the same spacecraft has used its more powerful HiRise camera - with a resolution of 30cm per pixel - to focus on the landing zone and produce the images released today. In a bitter irony, it was the same US orbiter that managed to spot Europe's earlier attempt at a Mars landing, with the Beagle-2 mission in 2003. Those images showed how the tiny craft had made it to the surface in one piece but then failed to fully open its solar panels which meant that it could not communicate or survive. On Nov. 1, 2016, the High Resolution Imaging Science Experiment (HiRISE) camera on NASA's Mars Reconnaissance Orbiter observed the impact site of Europe's Schiaparelli test lander, gaining the first color view of the site since the lander's Oct. 19, 2016, arrival. These cutouts from the observation cover three locations where parts of the spacecraft reached the ground: the lander module itself in the upper portion, the parachute and back shell at lower left, and the heat shield at lower right. The heat shield location was outside of the area covered in color. The scale bar of 10 meters (32.8 feet) applies to all three cutouts. Schiaparelli was one component of the European Space Agency's ExoMars 2016 project, which placed the Trace Gas Orbiter into orbit around Mars on the same arrival date. The ExoMars project received data from Schiaparelli during its descent through the atmosphere. ESA reports that the heat shield separated as planned, the parachute deployed as planned but was released (with back shell) prematurely, and the lander hit the ground at a velocity of more than 180 miles per hour (more than 300 kilometers per hour). Information gained from the Nov. 1 observation supplements what was learned from an Oct. 25 HiRISE observation, at http://photojournal.jpl.nasa.gov/catalog/PIA21131, which also shows the locations of these three cutouts relative to each other. 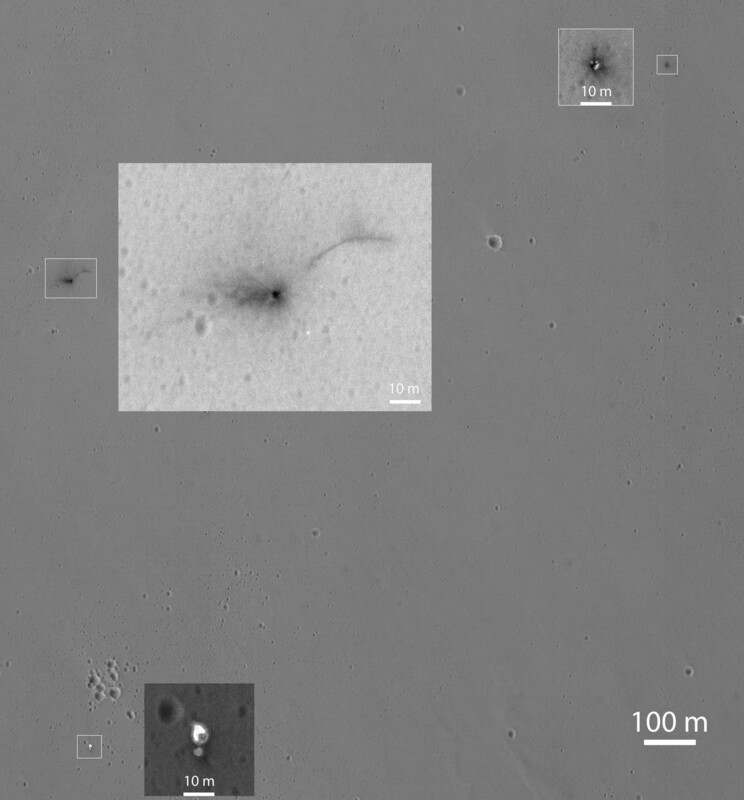 Where the lander module struck the ground, dark radial patterns that extend from a dark spot are interpreted as "ejecta," or material thrown outward from the impact, which may have excavated a shallow crater. 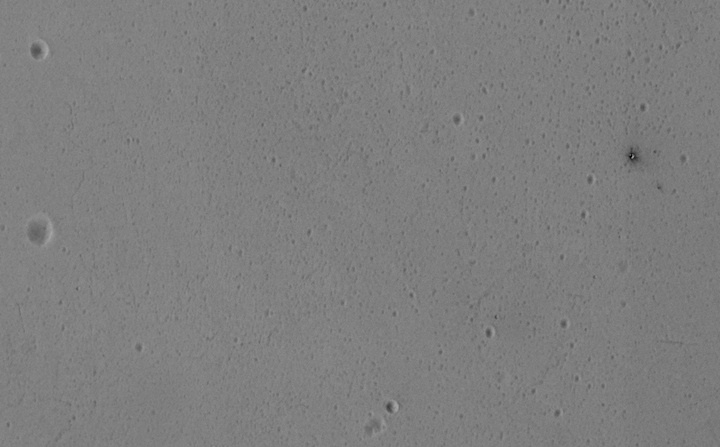 From the earlier image, it was not clear whether the relatively bright pixels and clusters of pixels scattered around the lander module's impact site are fragments of the module or image noise. Now it is clear that at least the four brightest spots near the impact are not noise. These bright spots are in the same location in the two images and have a white color, unusual for this region of Mars. The module may have broken up at impact, and some fragments might have been thrown outward like impact ejecta. The parachute has a different shape in the Nov. 1 image than in the Oct. 25 one, apparently from shifting in the wind. Similar shifting was observed in the parachute of NASA's Mars Science Laboratory mission during the first six months after the Mars arrival of that mission's Curiosity rover in 2012 [http://photojournal.jpl.nasa.gov/catalog/PIA16813]. At lower right are several bright features surrounded by dark radial impact patterns, located where the heat shield was expected to impact. The bright spots appear identical in the Nov. 1 and Oct. 25 images, which were taken from different angles, so these spots are now interpreted as bright material, such as insulation layers, not glinting reflections. This sequence of seven images from the High Resolution Imaging Science Experiment (HiRISE) camera on NASA's Mars Reconnaissance Orbiter shows wind-caused changes in the parachute of NASA's Mars Science Laboratory spacecraft as the chute lay on the Martian ground during months after its use in safe landing of the Curiosity rover. The parachute decelerated Curiosity's descent through the Martian atmosphere on Aug. 5, 2012 (PST; Aug. 6, UTC). HiRISE acquired these images on seven dates from Aug. 12, 2012, to Jan. 13, 2013. Each image's date and HiRISE catalog number are superimposed at the bottom of the image. The parachute canopy is the bright shape in the lower half of each image. Suspension lines still attach it to the spacecraft's back shell, which is the bright shape in the upper half of each image. The length of the parachute, including the lines, is about 165 feet (50 meters). This sequence shows distinct changes in the parachute. In the first four images, there are only subtle changes, perhaps explained by differences in viewing and illumination geometry. Sometime between Sept. 8, 2012, (the fourth image) and Nov. 30, 2012, (the fifth image) there was a major change in which the parachute extension to the southeast (lower right) was moved inward, so the parachute covers a smaller area. In the same time interval some of the dark ejecta around the back shell brightened, perhaps from deposition of airborne dust. Another change happened between Dec. 16, 2012, (the sixth image) and Jan. 13, 2013, (the final image) when the parachute shifted a bit to the southeast. This type of motion may kick off dust and keep parachutes on the surface bright, to help explain why the parachute from Viking 1, which landed on Mars in 1976, remains detectable (as seen at PIA01881). The Mars Science Laboratory parachute is the largest ever used for a Mars landing. When fully open during descent through the atmosphere, it had a diameter of 51 feet . A gap between the white and orange-hued sections prevented the chute from being torn during descent. You can see a duplicate of the parachute inflated during testing at PIA11994 and see the opened parachute during the actual descent of the Mars Science Laboratory spacecraft at PIA15978. A color image of the parachute on the Martian ground is at PIA16142. A stereo image of it is at PIA16209. HiRISE is one of six instruments on NASA's Mars Reconnaissance Orbiter. The University of Arizona, Tucson, operates the orbiter's HiRISE camera, which was built by Ball Aerospace & Technologies Corp., Boulder, Colo. NASA's Jet Propulsion Laboratory, a division of the California Institute of Technology in Pasadena, manages the Mars Reconnaissance Orbiter project for NASA's Science Mission Directorate, Washington. TECH 15:57 08.11.2016(updated 15:58 08.11.2016) Get short URL18121 The main objective of the Trace Gas Orbiter (TGO) of the ExoMars-2016 mission is to prove the existence of methane in the planet’s atmosphere, which could lead to the confirmation of the existence of life on Mars. MOSCOW, The Trace Gas Orbiter of the joint ExoMars-2016 mission of Roscosmos and the European Space Agency (ESA) will carry out its initial observations and calibrations on Mars on November 20-28, according to the Russian Space Research Institute (IKI) of the Russian Academy of Sciences. "20-28 November the activation of scientific instruments on board the machine Trace Gas Orbiter (TGO) of the ExoMars-2016 mission will be carried out. Four of the devices — including two Russian — will carry out the first calibrations and measurements on the highly elliptical orbit around the planet," the institute announced on its website on Monday. On board are four instrument for the study of the atmosphere and surface of Mars: NOMAD, CaSSIS, ACS and FREND. The latter two were designed and built by the IKI. The TGO is expected to carry out an elongated orbit for most of 2017, working gradually toward a circular orbit, which is expected to be achieved by March 2018. After this all of the orbiter's machinery will be activated. NASA Obtains First Color Images of Schiaparelli Mars Lander’s Crash Site The main objective of the TGO is to prove the existence of methane in the planet’s atmosphere, which could lead to the confirmation of the existence of life on Mars. A Russian Proton-M rocket carrier lifted off with the ExoMars’ orbiter and the landing modules from the Baikonur Cosmodrome in Kazakhstan on March 14. 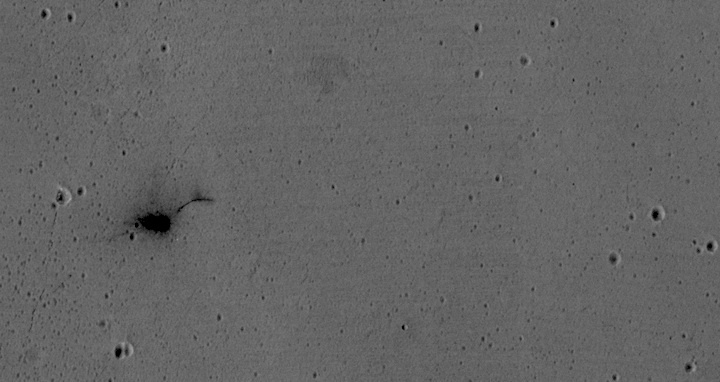 The Schiaparelli lander, which was meant to test technologies for the second ExoMars expedition, scheduled for 2020, was ejected from the TGO on October 16, but failed to successfully reach the surface of Mars. The European Space Agency (ESA) has confirmed that the lander crashed. 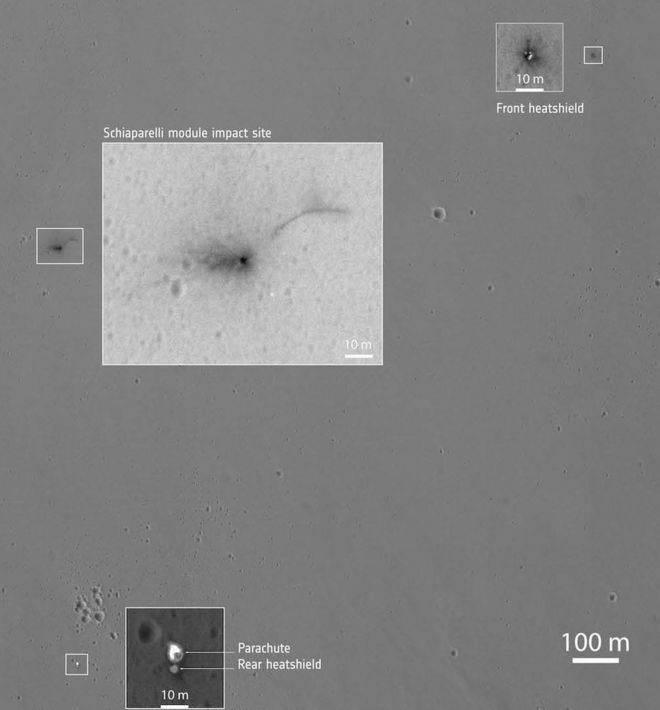 The European Space Agency has released details from its preliminary report into the Schiaparelli crash on Mars. The investigation confirms the probe misinterpreted sensor data, which made it think it was below ground level, when in reality the module was still at an altitude of around 3.7km. This prompted Schiaparelli to jettison its parachute too early and to fire its landing rockets for just three seconds. These actions put the probe into a freefall that led to its destruction. A crater and scattered hardware were later imaged by an American satellite. "This is still a very preliminary conclusion of our technical investigations," said David Parker, Esa’s director of human spaceflight and robotic exploration. "The full picture will be provided in early 2017 by the future report of an external independent inquiry board, which is now being set up, as requested by Esa’s director general, under the chairmanship of Esa's inspector general. "But we will have learned much from Schiaparelli that will directly contribute to the second ExoMars mission being developed with our international partners for launch in 2020." 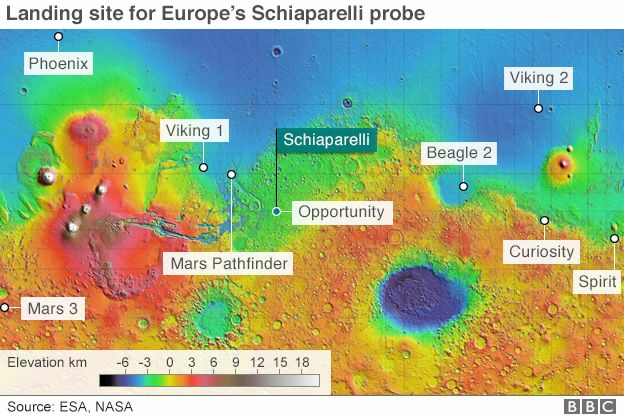 Schiaparelli was part of Esa's ExoMars programme - a joint venture with the Russians - which is endeavouring to search for evidence of past or present life on the Red Planet. The 600kg robot was conceived as a technology demonstrator - a project to give Europe the learning experience and the confidence to go ahead with the landing on Mars in 2021 of an ambitious six-wheeled rover. This future vehicle will use some of the same technology as Schiaparelli, including its doppler radar to sense the speed and distance to the surface on descent, and its guidance, navigation and control (GNC) algorithms. Engineers will be encouraged that so many key systems on the descent probe worked as expected on 19 October. The parachute deployed as planned at an altitude of 12km when the probe was travelling at a speed of 1,730km/h. The vehicle's heatshield, too, did its job of slowing the probe and protecting it from the high temperatures of atmospheric entry - and this disc-shaped shield was released at an altitude of 7.8km. But it was then that the descent sequence started to go awry. Schiaparelli's inertial measurement unit (IMU) had earlier sensed rotational accelerations in the probe when the parachute first opened that very briefly stepped outside what had been anticipated. The data became "saturated". Unfortunately, when this information was then taken in by the GNC system, the probe incorrectly updated where it thought it was in the descent. And when the data from the doppler radar subsequently kicked in, the error already in play was propagated forward. At one stage, Schiaparelli even calculated its position to be several metres below the surface of the planet. "The system ended up calculating a negative altitude," explained Esa's Schiaparelli's manager, Thierry Blancquaert. "And this is when the probe initiated the other steps - which was to release the parachute attached to the backshell, switch on the propulsion system, and then switch it off, and then switch to surface mode."